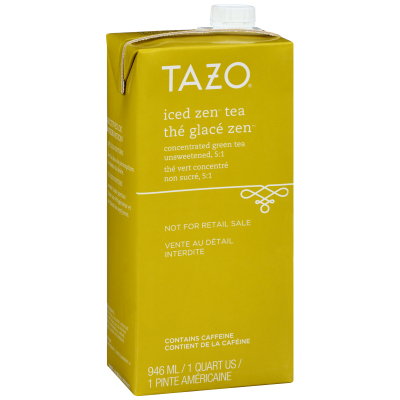 With harmonious flavour and aroma, Tazo Fresh Brewed Tazo Zen Green Iced Tea Concentrate creates an exquisite beverage that invites your guests to sip, contemplate, and engage. Requiring no brewing, this premium iced tea concentrate combines refreshing green tea with a twist of bright spearmint and zingy lemongrass for a blend that awakens the senses. This delicious tea concentrate also allows you to easily expand your beverage offerings to include creative drinks like green tea lattes, tea cocktails, spritzers, and more. Whether you're an office manager looking to ignite the creativity of your workforce, or a café owner in search of a deliciously unique flavour offering, you will love serving this beverage that brings a little enlightenment with every sip.